Have you ever wanted to Experience Bali? Then this is your chance to speak with the Experts! 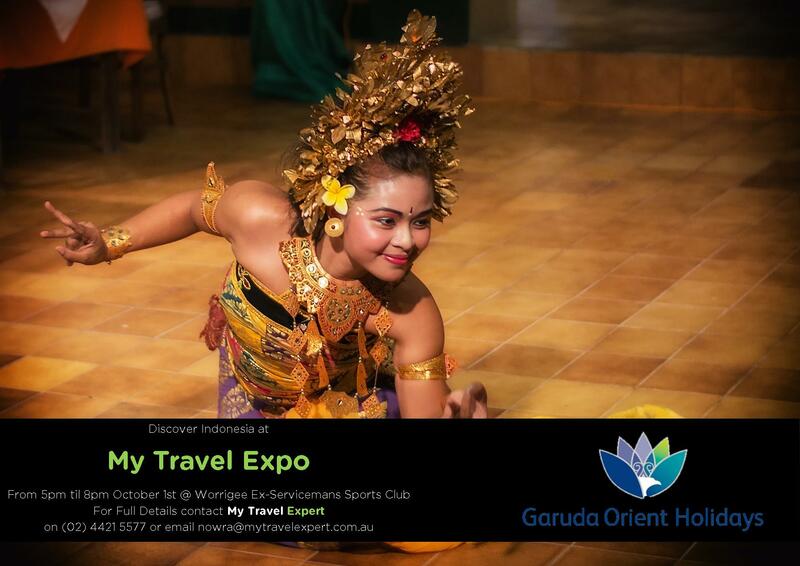 On the 1st October from 5pm to 8pm at Worrigee Ex-Servicemans Sports Club we are hosting the South Coasts largest Travel Expo – My Travel Expo, we have several companies attending who specialise in Bali including Garuda Orient Holidays, Qantas Holidays and More. Garuda Orient Holidays are the touring arm of the National Airline of Indonesia and provide one of the most comprehensive products to the region with some of the best deals to Bali out there. More they have staff dedicated to events such as Weddings and Conferences, and are one of the best companies to speak to about exploring further into Indonesia than Bali – to Java, Sumatra and more. So if Indonesia is of Interest than Garuda Orient Holidays are the experts you want to talk with!